There is an interesting documentary up on RT about the failed August 1991 coup. It is ironic that the cabal that attempted to overthrow Gorbachev actually succeeded - just not in the way they intended. The real winner of the August 1991 drama was Boris Yeltsin, who proceeded to put Gorbachev out of work by dissolving the Soviet Union. These days, the American press is waxing nostalgic for Boris Nikolayevich, pining for the days when Russia was a "democracy" (which in Empire-speak translates to "does what it's told"). Yet most Russians seem to remember Yeltsin as the fellow who ran Russia into the ground while drinking his troubles away, a buffoon propped up by the Americans. Yeltsin was ousted in a palace coup at the end of 1999. He died in 2007, and was given a state funeral. Perhaps that was more out of respect for the symbolism - him being the first democratically elected president of the Russian republic and all - than for the man himself. Who knows? Gorbachev is still around, making a living off the laurels of being the last Soviet leader. Though his word is eagerly quoted in the West, in Russia itself he commands very little respect. Simply put, nobody is nostalgic for the Yeltsin days, or even the last days of the USSR. Russians' support for the current government, warts and all, is almost plebiscitary. I used to get angry seeing the rampant Russophobia on the pages of American papers. Now I find it amusing. It's all part of the world of fetish and fantasy the Atlantic Empire leadership prefers over actual reality. At the end of the Cold War, they had a choice: be a shining example for the world, or surrender to the temptation of unrestrained power. They chose power - and failed. If sneering at others makes them feel better about that failure, so be it. The Russians have paid a steep price for their delusions, and seem to have learned something from their mistakes. Would that the Americans will be so fortunate, when it's their turn. I really don't have much to add to my 2005 essay about "Operation Storm," the Empire-sponsored ethnic cleansing operation by which Franjo Tudjman's government effected a final solution of its "Serb problem." Though the Hague Inquisition has declared it part of a "joint criminal enterprise" when convicting two Croatian generals in April, it is unlikely this verdict will be allowed to stand for long. Zagreb maintains that this was a great and noble victory, celebrates the holiday as "Homeland Thanksgiving Day" and - most importantly - the sponsors of the operation still look upon Croatia with favor, even as it is no longer their "junkyard dog." There is no doubt that "Storm" was cooked up in the Pentagon kitchen; the Empire doesn't deny its mercenary outfit MPRI was instrumental in turning Tudjman's army from rabble into something resembling a military. A decade later, the pattern was repeated in Georgia (which eventually attempted a similar-style operation, albeit with a very different outcome). Of course, the conquest of Krajina was greatly helped by the fact that Croatians had the Serbs outnumbered, outgunned, surrounded, blinded (NATO airstrikes took out their communications) and - last, but not least - abandoned. 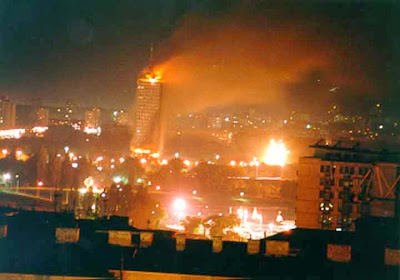 Perhaps the calculation in Belgrade was that the sacrifice of Krajina might save Serbia from Imperial invasion; if so, they soon realized their mistake. But that's a topic I'll save for later. Croatians and their Western advocates erroneously label the war a struggle for independence; no one - not Belgrade, nor the Krajina Serbs - actually sought to stop Croats from having their own state, as much as that would have been a perfectly legal course of action under the extant Yugoslav constitution. The only thing in dispute was whether a Croat government - moreover, one that has deliberately sought continuity with the WW2 Ustasha - had any right to rule over territories inhabited mostly by ethnic Serbs. There is one aspect of that conflict that remains largely ignored: the involvement of Kosovo Albanians in the Croatian military. I am not aware of any research into the actual number of Albanians who joined Tudjman's forces. There is anecdotal evidence of Albanians fighting in both that war, and the subsequent/parallel war in Bosnia, where they supported the Muslim government of Alija Izetbegovic. But the plural of anecdote is not data. More research is needed. Two names do come to mind, however. Rahim Ademi was a brigadier-general during the Medak Pocket operation, and was even put on trial for war crimes there, but was acquitted by a Croatian court - surprise! - along with General Norac, in 2008. Somewhat more (in)famous is Agim Ceku, who also joined Tudjman's army in 1991, and took part in the Medak operation (where he was wounded). Ceku commanded Croatian army units during "Storm." After the war, Tudjman gave him command of the 5th Military District - but in 1998, he "retired" to join the KLA, which was being rebuilt in Albania (the Serbian law enforcement having successfully quashed the Jashari rebellion). Neither Ceku nor his political superior, KLA supreme leader Hashim Thaci, have ever been charged with any atrocities, even though under the Inquisition's own doctrine of command responsibility they were ultimately responsible for every single act of terrorism their underlings (such as Fatmir Limaj or Ramush Haradinaj) had committed. Thaci is now "Prime Minister" of the self-proclaimed Kosovaristan, while Ceku simply changed insignia and continued to command the KLA under the name of "Kosovo Protection Corps" (which now passes for Thaci's military). The Official Truth in Croatia (and Kosovia) is that their separatist rebellions were legitimate self-defense from "Serbian oppression" embodied in the evil Slobodan Milosevic. The problem with this theory is that it completely fails to explain the prior history of Albanian and Croat belligerence towards the Serbs, which predates Milosevic by a great deal. What is one to make of Albanian separatism in Tito's Yugoslavia, which created Kosovo as a political entity in the first place, invested vast amounts of money into its modernization, and provided a welfare system that enabled Albanian families to have a dozen children or more? What is one to make of the 1973 "Maspok" (mass movement) events in Croatia, long before Milosevic was even on the political radar? And for that matter, what about the Croat and Albanian alliance with Hitler in WW2, exemplified by the "Independent State of Croatia" and its Devil Division at Stalingrad, or the 21st Waffen-SS division "Skanderbeg", composed primarily of Albanians from Kosovo? When one connects the dots, the pattern is there: Croats and Albanians, joined in pursuit of the same cause. Where Hitler failed to deliver, the Atlantic Empire succeeded (so far, anyway). It seems everything is in the choice of allies.